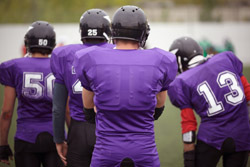 In response to a lawsuit after a college football player died from complications due to sickle cell trait (SCT) during a workout, the NCAA implemented mandatory SCT screening of all Division I student-athletes. A new study evaluated the impact of that policy and found that testing alone will help identify more than 2,000 athletes with SCT, but warns that screening alone will not prevent death. Tarini and her co-authors, M. Alison Brooks, M.D., a pediatric sports medicine physician at the University of Wisconsin, and David G. Bundy, M.D., an assistant professor of pediatrics with expertise in sickle cell disease at Johns Hopkins University, found that without a strictly enforced intervention, approximately seven NCAA Division I athletes would die suddenly as a complication of SCT during a 10-year period. The association between SCT and overexertion was first identified by the U.S. military in the 1970s. Instead of implementing a universal screening policy, the military enforced a universal intervention program and was successful in preventing all subsequent sudden death in recruits with SCT. Tarini, Brooks, and Bundy found that the NCAA screening program requires that 144,181 student-athletes from a four-year cohort would need to be screened to prevent one death—assuming 100 percent intervention —and would cost somewhere between $1.4 and $3 million. A universal intervention policy like the one implemented in the U.S. military could prevent all deaths associated with SCT and overexertion as well as death among other athletes from other life-threatening complications like cardiovascular conditions. Tarini and colleagues analyzed NCAA reports, population-based SCT prevalence estimates, and published risks for exercise-related sudden deaths. They used these to estimate the number of sickle cell carriers and the number of potentially preventable deaths with mandatory SCT screening of NCAA Division I athletes. Using the most recently published, publicly available NCAA participation rates from academic year 2007–2008, they estimated the number of Division I athletes in a four-year cohort to be 81,073 males and 63,108 females. The study, “A Policy Impact Analysis of the Mandatory NCAA Sickle Cell Trait Screening Program,” is available online in the journal Health Services Research. It is part of a special issue on “Bridging the Gap Between Research and Health Policy” featuring research articles from current and former Robert Wood Johnson Foundation Clinical Scholars that will be released in print in February 2012. Tarini, Brooks, and Bundy are all former RWJF Clinical Scholars. For more than three decades, the Robert Wood Johnson Foundation Clinical Scholars program has fostered the development of physicians who are leading the transformation of health care in the United States through positions in academic medicine, public health, and other leadership roles. Through the program, future leaders learn to conduct innovative research and work with communities, organizations, practitioners, and policy-makers on issues important to the health and well-being of all Americans. This program is supported in part through a collaboration with the U.S. Department of Veterans Affairs. For more information, visit http://rwjcsp.unc.edu.